James Scott, the rebel commander. 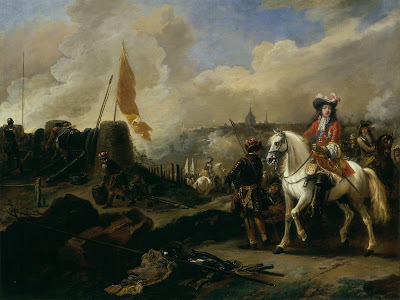 Claiming that he was the true Stuart heir and that James II was a Popish usurper, the Duke of Monmouth set sail for England in June 1685 to incite a 'Protestant' uprising. Landing in the West Country he received a warm welcome. On 20 June, before magistrates brought at sword-point to witness the event, the Duke declared himself King of England, Scotland and Ireland. As there were now two King James IIs, the new King was to be known, at least temporarily, as 'King Monmouth'. The original James II responded by despatching the Earl of Feversham to the West Country with a Royalist force of 2,500 men. Faced with a real army, the enthusiasm of Monmouth's following of untrained country yeomen began to wane. By the time they faced Feversham in battle their numbers had dwindled from 7,000 to 3,000 men. On 5 July, having learned that 'King Monmouth's' rebel forces were at Bridgwater, Feversham camped nearby at Westonzoyland. In one last, desperate bid for power Monmouth decided to risk all on that most hazardous of manoeuvres: a surprise night attack. As the lights of Bridgwater faded from sight, Monmouth's men embarked on their night march with grim resolve. Stealth was essential to their plan. Each man was under strict orders to kill the man next to him if he spoke or made a sound. With the hooves of their horses muffled in rags and the wheels of their four gun carriages greased into silence, the mute rebels hugged the shadows like a phantom army. While Feversham's officers and cavalry were billeted in Westonzoyland, his main encampment was on nearby Sedgemoor. The guns and primary defences of this camp faced west towards Bridgwater, from whence the Royalists anticipated any attack would come. Westonzoyland was to the south of them and they were protected from the north and east by deep drainage dykes (known locally as rhynes) and the treacherous ground of Sedgemoor itself. As an added precaution cavalry picquets from the King's Horse Guards and Sir Frances Compton's Regiment patrolled in all directions. 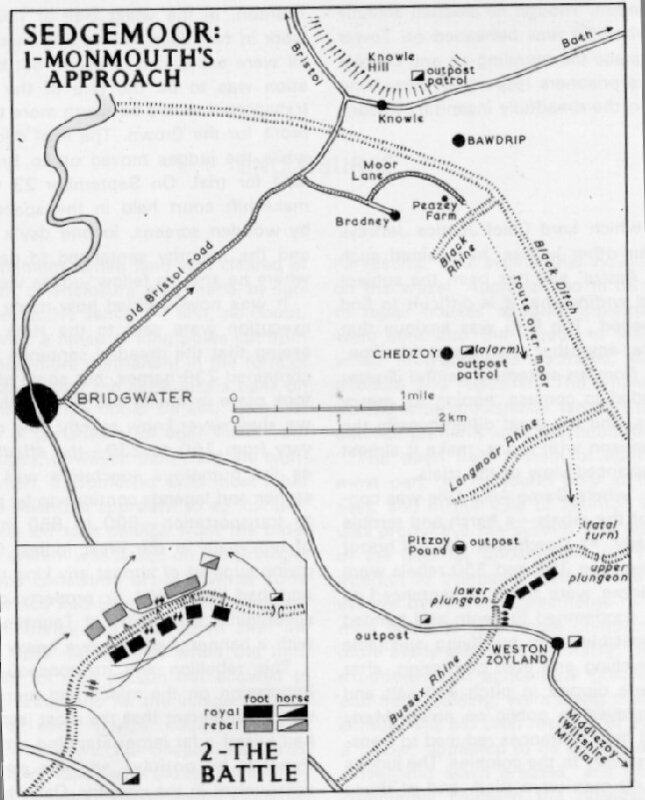 Aware that the Royalist guns had been placed to cover the Bridgwater road, Monmouth's plan was to march across the moor at night and attack unexpectedly from the northwest. His poorly armed peasantry would be required to find their way over the difficult moorland in darkness and silence, avoiding the Royalist picquets and keeping together in order to deliver an effective concentration of force at the other end. Finally they would be forced to cross the Bussex Rhyne right under the noses of the Royalists encamped on the other side. It was a strategy which would have tested far more experienced troops. At Peasey Farm on the edge of Sedgemoor they were forced to leave behind one of their four precious cannons, as a wheel persisted in squeaking. Worse still, the moon was lost behind a thickening cloak of fog. Ahead in the impenetrable gloom lay the ancient peat moor; an arcane landscape of swirling ground mist and deep black pools. To the superstitious minds of Monmouth's followers it was an unnerving prospect. With their fears magnified by the mist, the night-blinded rebels were soon reduced to feeling their way. In this manner they advanced, 'much incumbered, and retarded, by the narrowness of the lanes' into the dank environs of the deeper moor. Twice, during the course of that night, Sir Frances Compton's cavalry picquets were to pass within a stone's throw of the silent line of soldiers. Twice they failed to spot them, standing like statues in the impenetrable shadows. Monmouth's plan began to unravel after midnight. As the rebels filed across the Langmoor Rhyne, a lone picquet from Compton's regiment became aware of the ghostly shuffle of thousands of feet. Firing his pistol, he rode hell-for-leather, first to warn Compton and then to the Royalist camp behind the Bussex Rhyne. There he bellowed no less than twenty times 'Beat your drums, the enemy is come. For the Lord's sake, beat your drums'. In danger of losing the advantage of surprise, Monmouth ordered Lord Grey to ride ahead with the cavalry, cross the Bussex Rhyne (via the Upper Plungeon bridge) and attack the enemy's right flank. Meanwhile he would hurry the infantry forward to ' ... finish what the horse had begun, before the King's horse or cannon could get in order's In their rush to obey, Lord Grey's cavalry charged off into the mist without a thought for their poor local guide Benjamin Godfrey, who rather optimistically chased after them on foot. As he was the only one who knew the exact location of the Upper Plungeon, it would have been prudent to wait for him. Lord Grey's cavalry collided with Compton's patrol, also racing back towards the Royalist camp. In the brief, chaotic skirmish which followed the rebel horse were scattered; many vanishing into the misty night never to return. The rest became divided. By the time Grey found the elusive Bussex Rhyne, some 300 of his remaining force had fallen behind. To make matters worse his Lordship had no idea of the whereabouts of the Upper Plungeon crossing. Haphazardly turning right he began a fruitless search; oblivious to the fact that he was now traversing the frontage of the Royalist camp on the other side of the rhyne. In the meantime the missing 300 rebel horse finally blundered up to the rhyne and, turning the opposite way from Grey, stumbled upon the elusive Upper Plungeon crossing. Sadly for them the bridge had already been located by Compton's patrol who, as much from surprised fear as gallantry, now violently assaulted them with pistols and swords. Forced to fall back, the last of the rebel horse also collided with Monmouth's infantry. Surviving this additional fright, the rebel infantry pressed on steering themselves by a strange pink glow in the mist ahead. Only when they drew 'within about eighty paces' did they realise, with some shock, that this glow was caused by the lit matches of enemy musketeers in Dumbarton's Regiment (the only Royalist regiment at Sedgemoor still using the old matchlocks). Already emotionally drained by the difficulties and perils of the march, the rebels were now subjected to the very real dangers of a close volley. With the firefight escalating along their lines, they lost momentum and their courage began to fail. Monmouth had expected too much of raw troops. Though they stood and bore 'very considerable execution' from the guns of their enemies, not one regiment could now be induced by any means to advance another step. 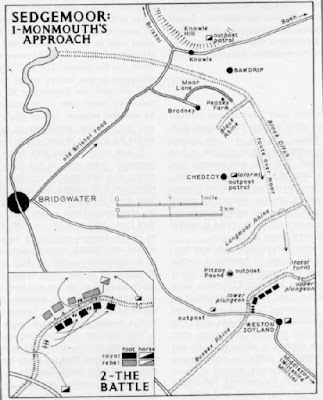 Meanwhile the Royalist defence consolidated and Feversham's cavalry ventured over the Upper Plungeon to skirmish with the rebel left. This was enough to persuade Monmouth that his dream had faltered within a 'halfe musket shot’ of his objective. Before his enemies could encompass him, the would-be king 'put off his arms, and taking one hundred guineas from his servant, left his foot still fighting, and went away'. By sunrise all effective resistance was over. As soon as it was light, Feversham's infantry swarmed over the Bussex Rhyne and scattered the remaining rebels. Through most of that long day Monmouth's supporters were tirelessly pursued and 'creeping into hedges and cornfields were started and shot like game by the King's soldiers’. About 1,000 rebels lost their lives at Sedgemoor, while Royalist casualties numbered less than 200. When Monmouth was captured nine days later, he had already despaired of life. In his pocket book he had written a prayer: 'I ask not of thee any longer the things of this world; neither Power nor Honours, nor Riches, nor Pleasures. No, my God, dispose of them to whom thou pleasest, so that you give me mercy.’ However things stood between Monmouth and his maker, the ill-starred Duke was to meet no mercy at the hands of King James II. On 15th July 1685 he was beheaded on Tower Hill.